His next No. 1 hits came in 1964 with "Don't Be Angry" and "B.J. the D.J." (about an over-worked country music radio station disc jockey, who crashes his car in a rainstorm). In 1963, Jackson was the first artist to record a live album from the Grand Ole Opry with Old Showboat. Other song hits include "The Carpet on the Floor", "Why I'm Walkin'", "A Wound Time Can't Erase" and "I Washed My Hands In Muddy Water". Jackson also recorded a cover version of Lobo's 1971 hit, "Me and You and a Dog Named Boo", which became Jackson's final top 10 hit. 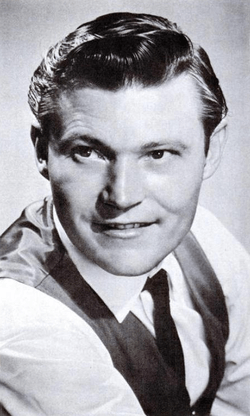 From 1958 to 1971, Jackson had 35 Top 40 country hits. Along with Ray Price, Webb Pierce, Carl Smith, Faron Young, Carl Butler, George Jones and Charlie Walker, Jackson is considered a cornerstone, after Hank Williams and Lefty Frizzell, of the hard-driving honky tonk sound in the late 1950s and early 1960s. Jackson lives on a farm in Brentwood, Tennessee with his wife Juanita, who is also his personal manager and operates his song publishing company, Turp Tunes. He has a son, Stonewall Jackson, Jr.
1 2 "Stonewall Jackson". Grand Ole Opry. Retrieved July 2, 2012. ↑ Roberts, David (2006). British Hit Singles & Albums (19th ed.). London: Guinness World Records Limited. p. 276. ISBN 1-904994-10-5. ↑ Murrells, Joseph (1978). The Book of Golden Discs (2nd ed.). London: Barrie and Jenkins Ltd. p. 115. ISBN 0-214-20512-6. ↑ "N.C. Music Hall of Fame offers tickets". The Salisbury Post. August 29, 2012. Retrieved September 10, 2012.